If there’s an aspect of global warming science that remains unsettled, it’s the general state of prediction and analysis over the fate of Northern Hemisphere sea ice. As is well known by now, model predictions greatly underestimated the pace of sea ice loss as a response to human-caused warming. 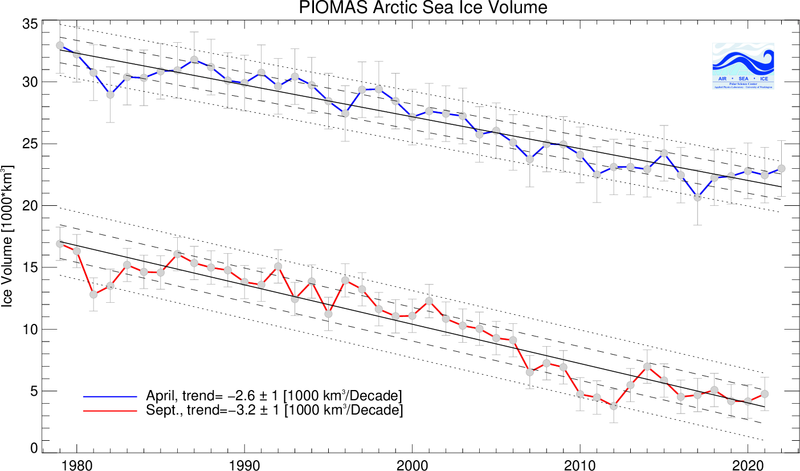 Big melt years like 2007 and 2012 brought sea ice extent and area, by end 2012, to less than 50% of 1979 values. 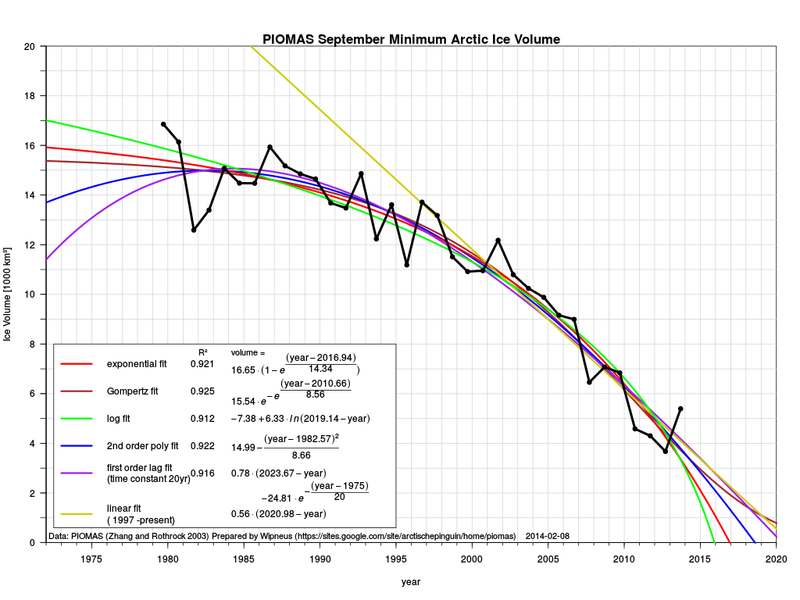 Sea ice volume for the same period was nearly 80% lower than 1979 measures. 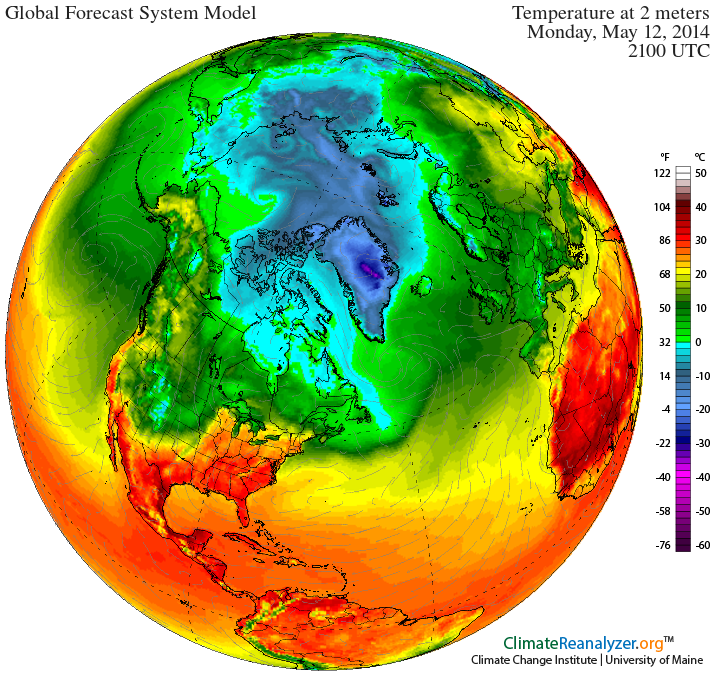 Such lows were generally not predicted to appear until the 2060s at the earliest. Ice response to rapid human warming and polar amplification, in these cases, was, for lack of a better description, outrageously stunning. And the weather impacts of such amazing losses were increasingly dangerous and far-reaching. Climate systems inertia, in the case of sea ice, seemed to be no match at all for the strong and likely unprecedented warming forces we’d already unleashed. Though much of what happened was and continues to be unexpected, a few overall patterns emerge in the data. Dynamic melt trends for area and extent were composed of massive melt years (2007 and 2012) followed by pseudo recovery years (2008, 2013) where the ice seemed to bounce back a little before inching again toward previous record lows (2009, 2010) or setting minor new melt records (2011 area) before the next big hit. Sea ice volume measures were somewhat less messy with massive melt years (2007, 2010), more minor melt years (2011, 2012), one minor pseudo-recovery year (2008) and one major pseudo-recovery year (2013). In this set, one year (2009) stands out as neither showing a new record low volume nor showing pseudo-recovery as end season volume fell off slightly from the previous year. The fact that 2009 followed a pseudo-recovery year (2008) may or may not be instructive for the current melt season. It is worth noting that in the volume progression, four out of seven years during the 2007 to 2013 period all showed new record lows. What one can read from these data points is that strong pseudo-recovery years (like 2013 and 2008) have typically been followed in recent years by a return to the decline trend but not to new record lows. So, statistically, this is what we would expect for 2014. That said, keep in mind that though it remains extraordinarily difficult to predict end sea ice states for any single year, the overall trend of major and unprecedented melt is most likely to continue and the window for a total sea ice loss by end season before 2020 remains wide open. Further, statistical analysis will, in every case, bow to emerging conditions on and beneath the ice. 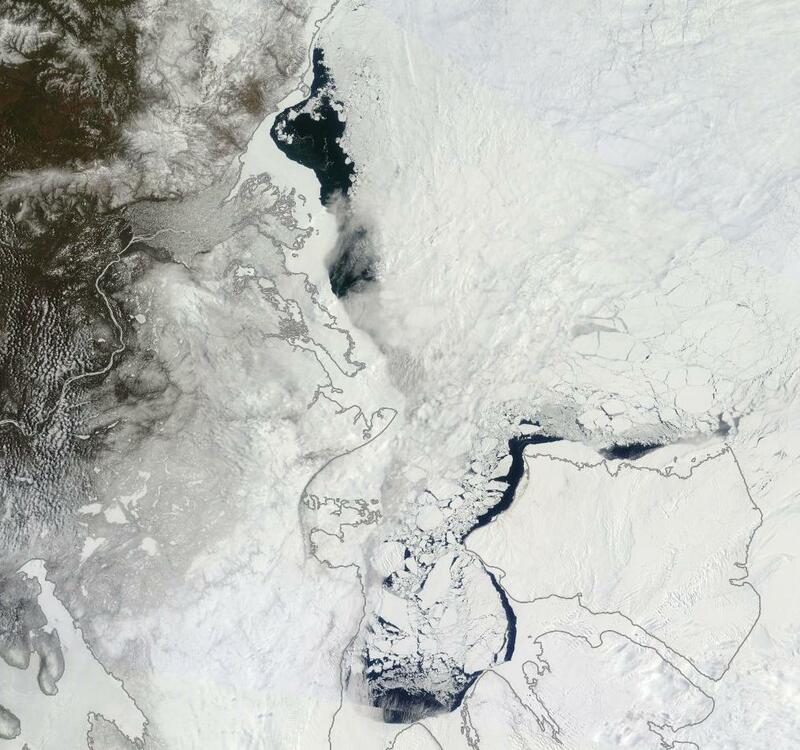 For the 2014 melt season, the fickle Arctic does not at all disappoint. By late April and early May of 2014, an extraordinarily warm winter period had wiped out most of the 2013 recovery in sea ice volume measures. By mid April, PIOMAS was showing volume in the range of second or third lowest year on record for the date. By today, May 12, sea ice area and extent measures were in the range of 4th to 5th lowest on record with both measures approximately mirroring 2007 values for the date. Given the potential for very rapid melt during June and July, as displayed in recent melt years, these values are within striking distance of new record lows should the weather conditions for rapid melt emerge. It is worth noting that May does not generally tend to be a predictive month for sea ice loss. In most cases, it is more a bottleneck period where values tend to crunch together as the sea ice softens up but generally shows few breaks toward the more rapid melt trends typically seen in June or toward a slower melt due to weather that is less favorable for ice degradation. That said, a few currently ongoing conditions may provide some strong indicators for how the 2014 melt season could progress. High amplitude Jet Stream waves through Eastern Siberia, the Bering Sea and Alaska. A doggedly persistent weakness in the polar Jet Stream along an arc from East Siberia to Western Canada has resulted in much warmer than usual conditions for the Bering Sea, the Chukchi Sea and regions of the Beaufort adjacent to the Alaskan and Canadian coasts. Warm air originating over a pool of much hotter than normal water in the Northern Pacific just south of Alaska has continued to flow up through the Bering Sea, into the Chukchi, and over Alaska and Western Canada and on into the Beaufort. Tracking this warm air flow resulted in a bit of incredulity as day after day observation showed the air continuing on through the Beaufort, past the North Pole zone, down over Svalbard and the Fram Strait, into the North Atlantic and finally being swept east in the strong cross-ocean wind pattern toward England and Ireland. In this way, air from 40 North Latitude in the Pacific jumped the pole to end up in the Atlantic near England. A persistence of this weather pattern would have numerous and potential critical impacts for the Arctic during the summer of 2014. First, it would result in a constant pressure of warmer than usual conditions for sea ice along an arc from the Mackenzie Delta and Adjacent Canadian Arctic Archipelago to the East Siberian Sea. Warm winds would assault the ice from launching pads over warmer land masses in this zone, resulting in increased and early ice erosions. The above image shows the Mackenzie Delta and the Canadian Arctic Archipelago on May 11 of 2014. In these images, we can seen the result of continued warm winds from the south and near-or-above freezing temperatures. For the Mackenzie Delta, temperatures since early May have ranged between 23 and 42 F, or between 5 and 25 F above average for this time of year. The high temperatures have brought the snow melt line all the way to the coast very early and have resulted in both ice melt and retarded refreeze in the broken ice and large polynyas offshore in the nearby Beaufort. Note that an additional heat influx to these coastal waters will occur once the shallow Mackenzie River fully melts, likely resulting in the early break-up of land-fast ice near the delta. Further along the Canadian and Alaskan coasts, we find a continuation of sea ice weakness and break up in the off-shore regions north of Barrow Alaska and on into the Chukchi Sea. Large polynyas remain open throughout the region and exhibit no refreeze in the open water sections. Past the Bering Strait zone, Chukchi melt is very well advanced for early-to-mid May due to a combination of near constant warm southerly wind influx and an advancing warm water wedge through the Bering Strait. This warm wind pattern through Eastern Siberia, Alaska and Canada and into the Arctic Ocean is reinforced by a combination of ongoing factors including a weakened polar Jet Stream which has tended to generate high amplitude ridges in this zone, a very warm pool of water in the Northern Pacific south of Alaska, and an emerging El Nino which historically has tended to push a high amplitude split in the Jet Stream up toward Alaska. These self-reinforcing factors make it likely that the overall pattern of warm southerly winds over the region will continue to persist and have an impact well into summer. Finally, it is worth noting that the current and ongoing warm air influx through this region provides a constant source of energy for Arctic storm genesis, a factor that may well become more significant as melt season progresses. Forecasts for the next 24 hours show a storm pulling warm, above-freezing temperatures deep into the Beaufort as it begins a transition toward the northern polar zone. It is the second system to exhibit such anomalous warm air inflow and progression into the Central Arctic during the month of May. A third warm air invasion, this time from Eastern Siberia, and potential related storm development is also projected for late this week or early next week. The Arctic dipole: storms over the Arctic Basin, high pressure over Greenland. Today, we track three Arctic low pressure systems — one emerging from the warm air influx over the Beaufort, one over the Laptev and one north and east of Svalbard. Greenland, meanwhile, shows a high pressure system centered almost directly over its large ice sheet. The net effect of these lows and highs is to funnel the warm wind streaming up from the Beaufort over the Northern polar zone near the Canadian Arctic Archipelago and out over the Fram Strait and Svalbard. It is a dipole of high pressure over Greenland and low pressure over the Arctic Basin on the Central and Eastern Siberian side that has lasted for about two months through Northern Hemisphere Spring. This set-up creates a strong and consistent wind pressure providing transport of sea ice out of the Fram Strait. It is worth noting that Fram Strait export was one of the primary factors involved in the record low sea ice total seen during 2007, so a consistent dipole pattern of storms over the Arctic basin and highs over Greenland promoting ice export could well weigh heavily as melt season progresses. Warming over Western Russia and Eastern Europe. A second zone showing consistent ridge development, polar Jet Stream weakness and coincident anomalous warming has emerged over western Russia and Eastern Europe. Such warming was seen during the weak El Nino of 2010 and resulted in severe heatwaves and wildfires for the region. A similar pattern has emerged in tandem with the rising and potentially far stronger 2014-2015 El Nino currently developing in the Eastern Pacific. Though it is too early to tell if this emerging hot zone will reach the extremes seen in 2010, this heat pool is likely to contribute warmth to sea ice zones in the Kara and Laptev Sea as the summer melt season progresses. So far, Kara sea ice retreat has remained within usual boundaries for recent years. However, it is worth considering the potential strength of this developing warm air pool and how it may impact adjacent Arctic zones as May progresses into June. This week’s forecast now shows above-freezing temperatures predicted to progress into the Kara and 50 degree F readings predicted to push into estuaries bordering the Kara over the next few days. Warm water upwelling, north wind flush, storm suction for Baffin Bay. Finally we come to Baffin Bay, a place many may well consider the Arctic Ocean’s red-headed stepchild. Over recent years, warm water up-welling, possibly driven in part by sea-bed methane release, in Northern Baffin Bay has resulted in an almost constant weakness and erosion of sea ice. This condition creates a bizarre circumstance in which Baffin is often surrounded by warmer waters north and south by late spring. This year is no exception. In addition, a north wind now appears to be flushing Baffin Bay sea ice toward the North Atlantic. The result is an expanding zone of ice-free water along the West Coast of Greenland pushing toward a widening gap in the north of Baffin Bay near the Nares Strait. To the south, a persistent storm has developed near an anomalous cool zone in the North Atlantic waters off of Newfoundland. This cold pool is likely a residual of the continued dipole, hot-west, cold-east temperature anomaly over North America which has increasingly been squashed toward Newfoundland with the emergence of summer. The cold North Atlantic pool is also likely fed by a rising outflow of fresh, cold water from Greenland glaciers as well as the Baffin Bay ice export already described. A growing Gulf Stream weakening is also well established for the region. The persistent storm is fed by high temperature differentials in the dipole zone. It is one of the remnant storm systems of this winter’s epic assault on the coasts of Great Britain — a possible precursor to even more vicious storms this coming winter. But, today, the storm is simply providing added suction to drain ice out of Baffin Bay. During late April, we talked a bit about the impact of early season melt ponds on end-season sea ice levels. For recent scientific studies have found that early season melt pond formation has a high correlation with new record lows in sea ice area and extent. But given the current very thin and broken state of sea ice, it’s worth considering whether the rules for sea ice loss aren’t in the process of changing. Ever since the 2012 melt season’s close, the Arctic Ocean has exhibited a very battered sea ice state. One featuring widely disassociated packs of broken and brittle ice riddled with a long and pervasive spidering of leeds. For large melt pond systems to develop, the ice pack needs to be relatively contiguous. But the recent ice pack shows very little continuity and could, instead, be said to basically lack integrity. Such a state may well prevent a degree of melt pond formation in areas in which the ice is more and more highly disassociated into floes. And it is this disassociated ice state that may be the current and future norm as sea ice continues to thin and weaken. In addition, rising temperatures in and around the Arctic have resulted in increased atmospheric water vapor content, increased cloud formation, and increased storm presence during summer periods. This progression toward storminess is consistent with paleoclimate studies showing that ice-free or near-ice-free Arctic states were much stormier than the current one. In the event of an expected stormier Arctic, melt pond formation may well result less from direct solar insolation through clear Arctic skies and more from an increasing number of rainfall and warm fog events over sea ice. Cyclonic pumping of warmer waters from below the ice pack into surface water zones and the mixing of waters by waves generated by storm winds is also likely to have a far greater impact on sea ice melt than seen in recent years. 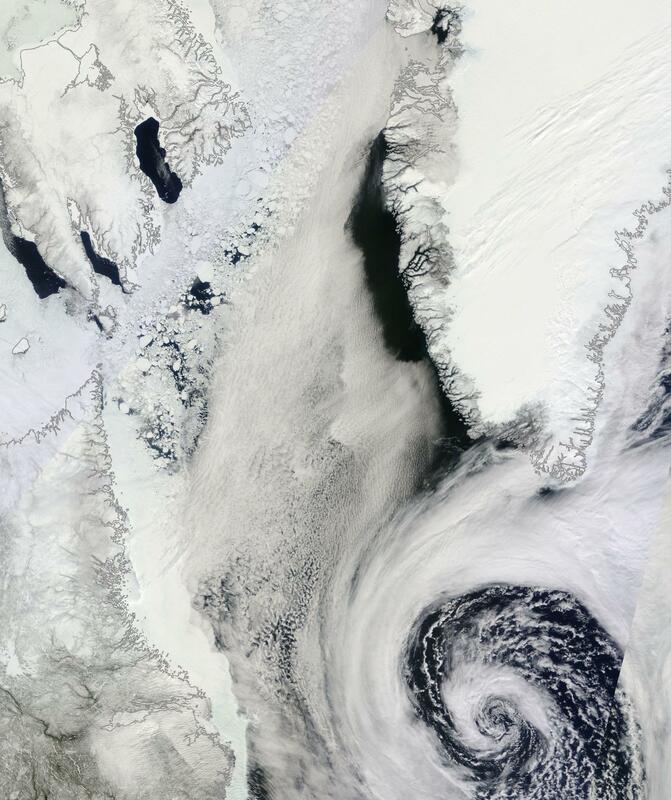 It is likely we saw a prelude to just such an event during the great, late-season Arctic Cyclone of 2012 which sent waves the size of houses roaring across the Beaufort Sea to batter and disassemble the already weakened sea ice. In this dynamic and changing system, warm winds are also likely to play a much greater role. Jet Stream erosion, in such a case, unleashes warm southerly winds on the sea ice. The winds, being warmer, hold a higher water vapor content than was typical for the Arctic prior to the human warming insult. Encountering ice and cold water, the water vapor in the winds condenses to form fog. The latent heat in the water vapor is thus released to do work melting the sea ice and warming the sea surface. In such cases, a kind of snow and ice eating mist develops from the warm wind — a blow torch for the sea ice. I think it’s a little dangerous to read too much into the general patterns mentioned above with respect to pseudo-recoveries because they’re based on such a short time period and on a system operating in a mode that we still do not adequately understand. We’re increasingly firmly into territory where the right combination of conditions would almost entirely destroy the sea ice, even if it’s still a bit more likely than not that it doesn’t happen this year. On such short time horizons the noise in the signal becomes more important to the precise timing than the signal itself (which can only give a guide as to increasing probability of the event year on year). Regardless, almost seven years after the record breaking events of 2007 – what has changed? A few more people are watching the ice, sure – but is anyone really acting in a meaningful manner that hints at sufficiency to the scale of the problem? Again the trends are all still mostly the wrong way – both in the earth system, but also in the human world. Any changes of a positive nature still have insufficient signal to register noticeably in the face of our chosen destiny. I tend to favor observation of ongoing weather patterns vs statistical analysis. Perhaps I was a bit too subtle with this post. In general, my opinion is that current weather patterns pose a risk for rapid sea ice loss this year. I think the summer ice loss is the leading indicator of the trend of the complex system feedback loops that are being perturbed by pollution. If there is a linear trend (i.e., summer sea ice goes to zero 10-20 years from now), then the trend for the rest of the year is also likely to be linear IMO (this is just an assumption since conditions are changing on the ground in a unique way). Then we have a bit more time to ward off the worst impacts. If the trend for summer ice loss is exponential then the rest of the Arctic will soon follow also exponentially and you can assume that the rest of the other feedbacks (methane, albedo loss, etc.) are also exponentially related. The trajectory of the earth system in response to carbon cycle perturbation is deviating (from some mirror reference trajectory where there is no such perturbation — this is an experiment that can’t be done in the real world since we have only one instance) in some manner. In chaotic systems, this is usually exponential in the long term but in the short term you can see linear deviations or even no deviation (it is within the bounds of the attractor). 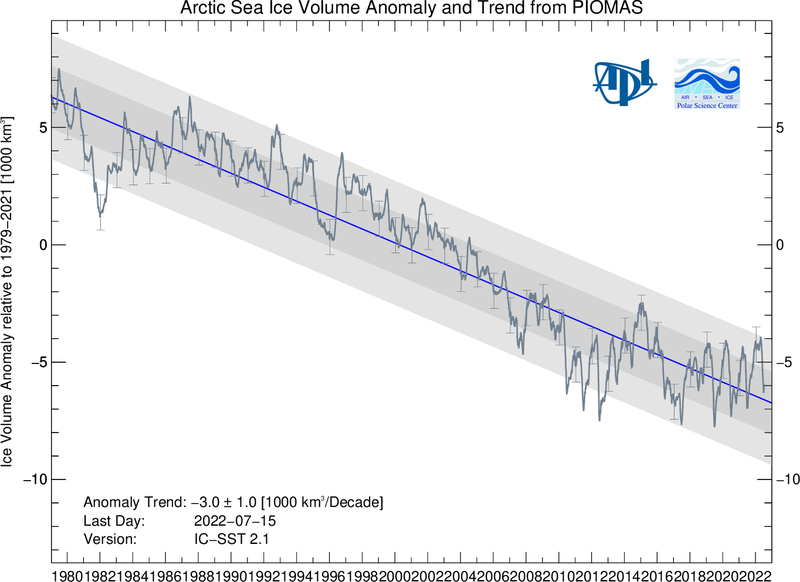 With the Arctic it’s clear something is happening but it’s unclear what the final trend will be at this point. I think we’re at the transition point to a new phase and the resulting trend will tell us how much time we have left. The trend line is closer to exponential than it is to linear. That said, my opinion is that the trend is more quadratic than anything else. The trend moves exponentially until it hits a negative feedback, plateaus there for a bit, then goes exponential again. Increased Greenland melt, at some point, should be a negative feedback. If it isn’t, we’re really, really in trouble. I find it faintly absurd anyone should even consider the notion of linear trends in systems exhibiting positive feedback characteristics. Especially with the evidence accumulating over the last decade. In the end, whether either are linear or (sub)exponential will be determined by observation. The current trend line for extent seems to be exponential but Robert is right that there’s a more complicated story to it with both positive and negative feedbacks intersecting (otherwise why have repeated strong recoveries after record lows it’d just keep going down exponentially) and I think the quadratic nature of it is reflected by the volume trend being closer to linear than exponential. However, once the ice is gone to zero either by volume or extent in September we can look at the average and say whether it represented a linear loss or a subexponential one an exponential one. This will then I think carry through to the other months (which have a close relationship to this one). This will give us some rough estimate of the time we have before we end up with catastrophic climate change (right now we’re already at dangerous climate change). So can you say for certain that the ice loss in area/volume in September will happen in 3 years, 6 years, or 12 years? I’m on the 3 year side myself personally but I’d not put much money on it. Robert, thanks, a very informative blog. I agree with your and ccgwebmater’s comments about statistical prediction – 2007 and 2012 by themselves were step changes making statistical analysis very difficult and information prior to 2007 of questionable relevance for the post 2007 world. Also, much more sensitive now to weather events that have a more random/chaotic impact. Not far now from the melt season proper – will be interesting to see how things pan out. 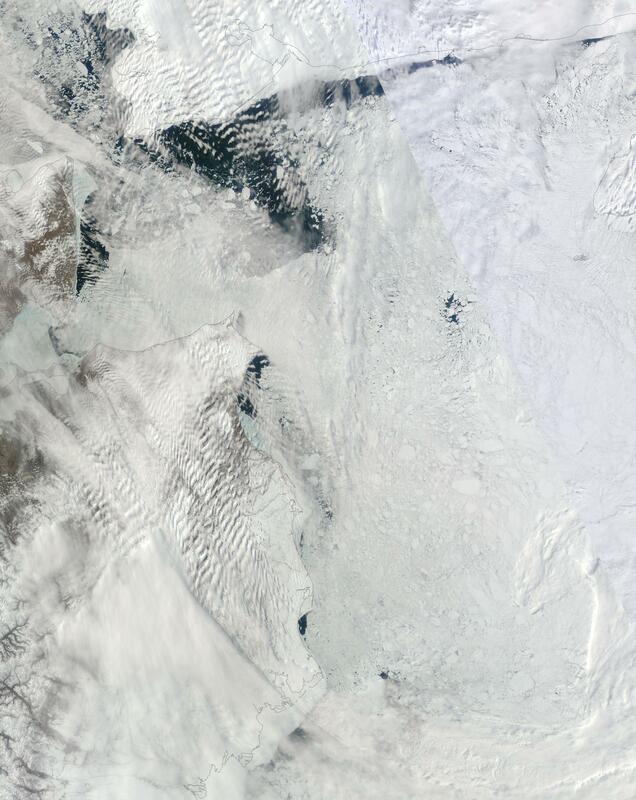 If you look at the MODIS shots, the pace at which Baffin Bay is draining of sea ice is just astounding. The temperature map from Reanalyzer is terrifying, I had to look at it 3 times because those above freezing areas are way far too north than they should be. If this continues than it will turn out very poorly this summer. I’ll see if areas I used to live at up there are deviating significantly (a little spelunking). Robert & Colorado Bob, I put links to both of you. If that is not desirable, let me know and I’ll remove them. I’ve popped up a piece on the artificial food chain subsections we have created. It can be found at. I’m gathering what I can find on the cascading effects we may see up north as you had suggested a couple of days ago. Mackenzie Delta region is quite warm today. The region does cool a little in the forecast as the East Siberian region heats up. Thanks for the links. Keep us posted on the new entry. Here in the Pacific Northwest in Portland, OR, temps in the high 80’s are forecast for the next couple of days. Human caused Bi-Polar meltdown are we. The whole flank is collapsing… Amazing and terrifying findings. Pretty impressive. 10-15 mile front on this one. Getting temps of 53 F on the Mackenzie Delta right now. … And above freezing temps on the 80 North Latitude line. Inuvik NWT (up the river from the delta). then back up to ~10C Friday & Saturday. That Inuvik forecast is crazy. 70 F to 16 F in one week. Back to 50 F by next week. The Delta is melting very early this year. McKenzie Delta may not be an agricultural area, but these temperature swings are happening elsewhere, and are a very real problem. As anyone who gardens can attest, gyrations above and below 32F simply destroy any chance of raising a crop. The early heat accelerates germination, but the next freeze wipes out the sprouts. The extra heat dries up the soil too quickly, so the stunted plants mature to seed ahead of schedule. This will certainly put pressure on food plants to evolve or disappear, and likely will lead to new main human crops that focus more on short-seasons, one in the Spring and the other in the Fall. And, food production will likely decline substantially.